Djed-Hapi’s mummy is in good condition overall. The outer linen wrappings are mostly stable and retain some flexibility, although folding or heavily manipulating them would cause them to tear. Several of the ends of the linen bands are loose, and some are slightly frayed. The linens around his feet, however, are more significantly damaged. You can see in this detail photo the bottom of his big toe is exposed where the linens have been damaged at the bottom of his feet. View of the bottom of Djed-Hapi’s feet. The red arrow points to his exposed toe! There are also lots of metal pins visible, which were used to secure areas of loose or falling linen. These pins belong to at least two campaigns of treatment. 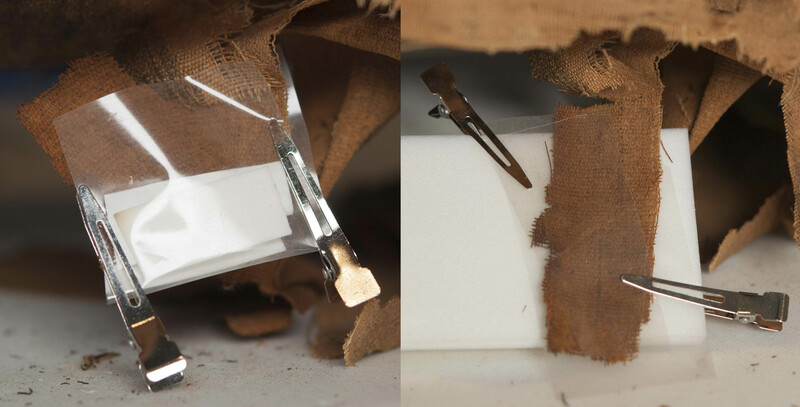 One set is of steel pins with flat heads, some of which were painted beige to hide them, but not until after they were already inserted in the linens and are now in some places stuck to the fabric. The other set is of black insect pins with brass heads. There is also evidence of adhesive used in a few places to secure loose linen pieces. Detail of the linens on the right side of Djed-Hapi’s body. 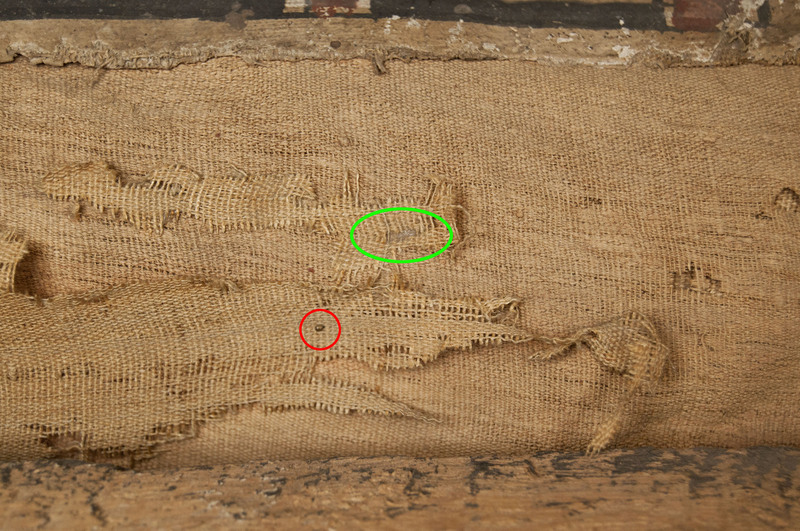 The red circle highlights the brass head of an insect pin, and the green oval shows where adhesive was used to reattach broken linen. Archival photos of an old display case here at the museum reveal that Djed-Hapi was removed from his coffin and displayed separately at least once. 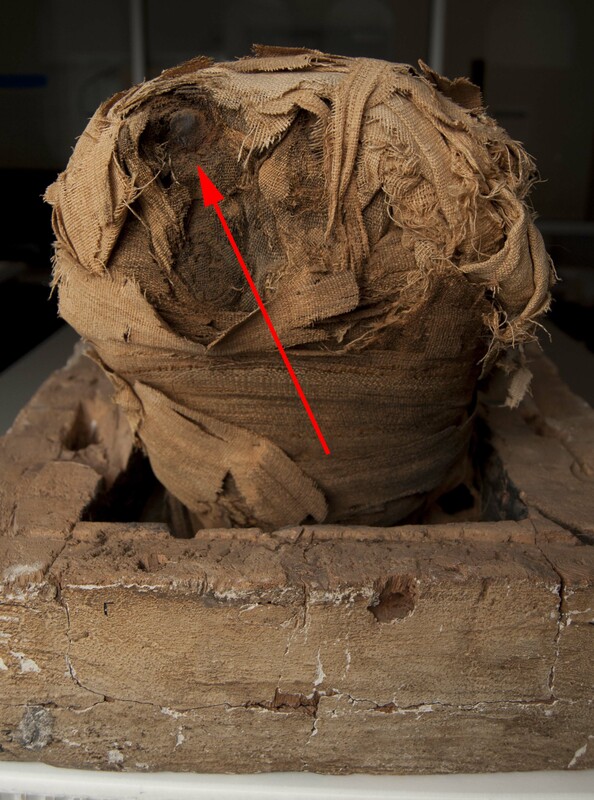 Currently, there are areas of hislinen wrappings which are folded back or otherwise misaligned, and it is likely this occurred when he was replaced in his coffin after being removed. 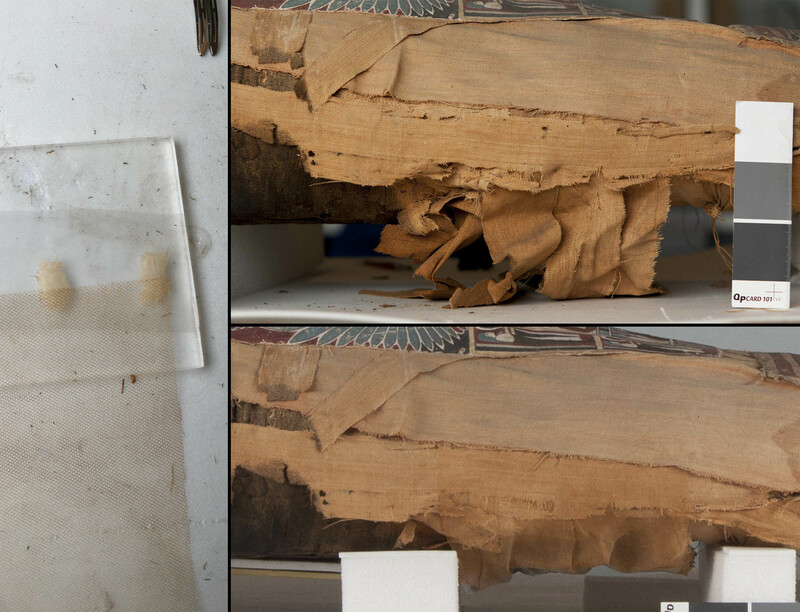 I was concerned about the condition of these areas of Djed-Hapi’s linen wrappings, and I decided that removing him once again from his coffin would give me much better access to assess and treat these areas properly. It took 5 people – one at the head, two at the shoulders/torso and two at the lower legs/ankles – working together to lift Djed-Hapi out of his coffin and on to a foam-covered board support. We took special care to support his loose ankles, and to keep the head from shifting. Left and right views of Djed-Hapi, after removing him from his coffin base. To begin the conservation treatment, the exterior linens and cartonnage pieces were cleaned using a HEPA-filtered vacuum with variable suction and soft brush. Next, the pins in the linen wrappings were removed systematically. In total, 16 steel pins and 42 insect pins were removed! Folds and creases in the linen wrappings were humidified and flattened using GORE-TEX fabric, which acts as a moisture barrier, allowing water vapor to permeate to the linen wrappings but preventing any liquid water from wetting and staining the linen. The linen was allowed to humidify for ~10-15 minutes. Then the areas were either lightly weighted, or clamped between sheets of Volara to flatten. During (left) and after (right) humidifying and flattening creases in Djed-Hapi’s linen wrappings. These areas could then be realigned, and were stabilized using nylon bobbinet fabric. The bobbinet was painted out using acrylic paints to match the color of the linen, and cut into bands which were long enough to reach from one side of the cartonnage pieces, around the back and to the other side. These bands were secured using tabs of Japanese tissue also toned with acrylics. These tissue tabs were adhered to the bobbinet using 3% Klucel in ethanol, then secured to the mummy using 5% methylcellulose in deionized water. The tabs were tucked under either the cartonnage chest and leg pieces, or the top layer of linen. 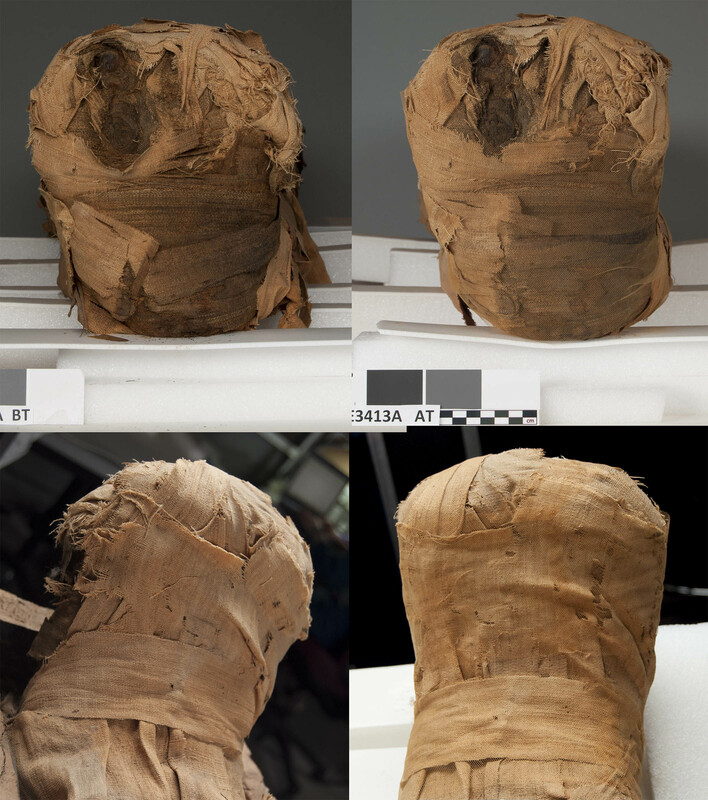 A few small sections of lifted linen, particularly along the sides of the mummy, were realigned and adhered using Japanese tissue and 5% methylcellulose in deionized water. On the left, a detail of tissue tabs on bobbinet. On the right, before (top) and after (bottom) humidification and realignment, followed by a bobbinet support. Because of how damaged and distorted the cartonnage foot covering was, it was removed from the mummy and treated separately (I’ll talk about this in the next blog post). This also allowed me to better see the linen wrappings around Djed-Hapi’s feet, and treat them more successfully. The linens around the feet were also encapsulated using toned bobbinet. Separate strips were used to support the linen around the ankles, under the heels, around the tops of the feet and around the toes. These bands were stitched together using hairsilk toned with acrylic paint. Before (left) and after (right) using toned bobbinet to stabilize and secure the linen wrappings around Djed-Hapi’s feet. After treatment annotated image of Djed-Hapi. You may notice this image also gives away a big decision I had to make regarding the treatment of Djed-Hapi’s mask….stay tuned for the next post to learn all about it! 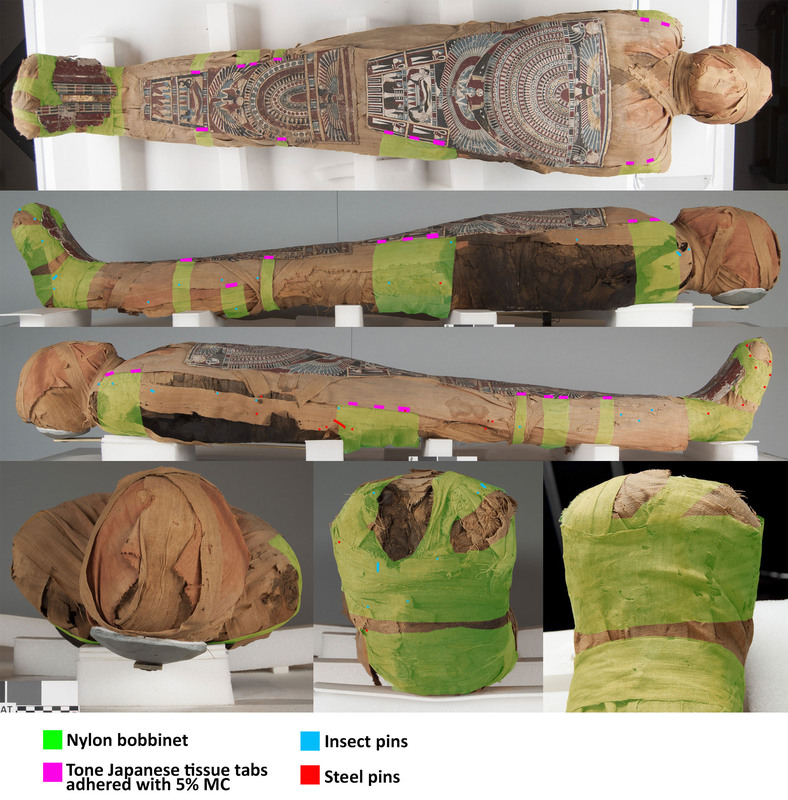 This entry was posted in conservation treatment, Egyptian storage move, Mummies, Objects In the Artifact Lab, on exhibit and tagged Djed-Hapi, human mummy, Japanese tissue paper, linen, methyl cellulose, methylcellulose, mummy, nylon bobbinett, stabilization, treatment by mollygleeson. Bookmark the permalink. This project is very tedious but interesting. You must pay attention to every details of the wrapping, right? How can you conserve the mummy? And how often do you treat the wrappings? I found this blog rather attracting to me as I was very interested in mummies and the mystries of Egypt since I was a little child. This blog explains how they treat the wrappings of Djed-Hapi, and I am really curious about him and get some knowledge of the treatment. I want to ask a question: Are all mummies treated in the same way? If not, what’s the differences? Hi,I am jieming Zheng.I am from the Xinjiang Province which is in the northwest of China. As we all know, in ancient times, Xinjiang was a g athering place for the minority nationalities. For example, we are very familiar with the city which including the ancient Wusun, Qiemo and the most controversial ancient loulan. Many of the archaeological discoveries in Xinjiang have been unearthed a lot of bodies. You can visit in Xinjiang museum. But the bodies in Xinjiang are not wrapped. They are dried. According to the reference of research. The earliest ancient countries in Xinjiang were founded by the people in the Middle East during the process of migration. Such as loulan is said that it is from Afghanistan. The two old places(like ancient Egypt and ancient northwest of China) both derive from the Middle East. Why do they deal with the bodies in two different ways? I think for the Egyptians there was a lot of rituals connected with mummification. You could say it was one of the most elaborate and advanced forms of mummification. The earliest Egyptian mummies were also not wrapped, but became mummified by the dry and warm sand. I could imagine the climate in Xinjiang is similar to Egypt, and so there you also had these “natural mummies” without wrappings or other treatment. I’m really sorry that I didn’t reply you in time.These days I also look up for some information about this.Thank you very much for your answer.It is very helpful for my future learning.